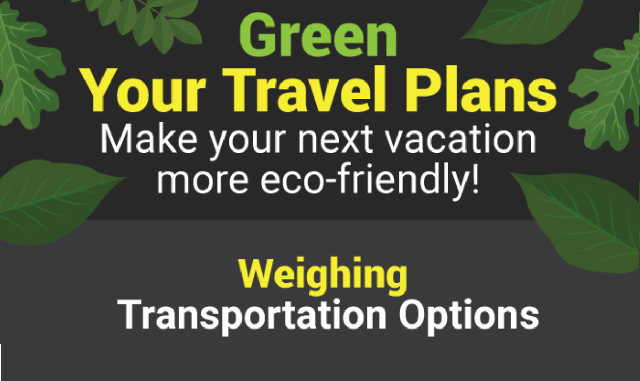 Green Your Travel Plans #infographic ~ Visualistan '+g+"
Planning a vacation? Heading out of town for the holidays? Sneaking in a romantic getaway? You’re not alone. Every aspect of your vacation, from transportation and accommodations to meals and activities, has an impact on the planet. With a little advance planning, it’s possible to make choices to minimize your eco impact. Transportation choices often depend on the destination. You can’t drive to Dubai, take a train to Torino, or carpool to Copenhagen. But for domestic travel – or transportation within each destination – it can be difficult to know whether planes, trains, or automobiles have the lowest eco impact.